Royal Gorilla Automatic is the strain that is blasting autoflowering cannabis to the top-shelf like a THC-powered rocket. The dankest US West Coast genetics have been successfully hybridised and fine-tuned to produce a genuine game-changing autoflowering strain. Royal Gorilla Automatic will take you to the next level of auto cultivation, delivering up to 20% THC buds in as few as 8 weeks. Indoors, the Royal Gorilla Automatic will grow to heights between 60-120cm. This larger size allows for greater bud production. Long-running colas and strong side branches will develop in optimal conditions. Yields of up to 400g/m² are possible. Moreover, Royal Gorilla Automatic is an easy cropping strain that is low-maintenance and ideally suited to the SOG method. In just 8-10 weeks post-germination, frosty, Diesel, and Kush-scented chunky buds will be ready for harvest. 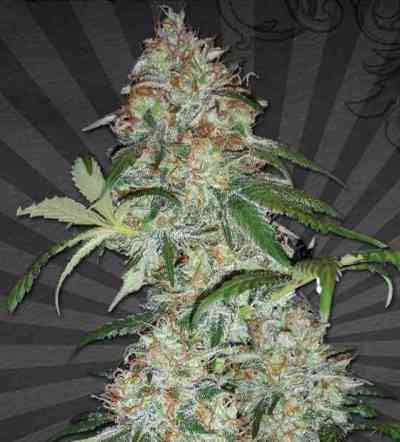 Outdoors in warmer climates, Royal Gorilla Automatic can grow as tall as 140cm and become an enormously productive bush with yields of 120-170g/plant possible. As she can flower independently of photoperiod, Royal Gorilla Automatic offers the potential for multiple harvests from spring to autumn. Large containers, good sunlight, well-draining soil, and minimal nutrients are all she needs to thrive outside. Royal Gorilla Automatic is immensely psychoactive, boasting 20% THC levels and minimal CBD. As a genetic cocktail of indica, sativa, and ruderalis genetics, she has a combined head-body effect. Make no mistake, she packs a King Kong knockout punch. An initial euphoric and cerebral buzz soon gives way to a happy couch-lock. This extra-gooey marijuana with the expansive Diesel flavour is more than a rival to photoperiod strains; Royal Gorilla Automatic is setting a new standard of rapid-flowering excellence.